Considering a double storey extension and looking for design ideas? Adding two storeys will give you lots of space and value and could be a cheaper option than moving. In addition, a double storey extension proves particularly cost effective, which means it could be worth upgrading a planned single storey extension to one with two floors. 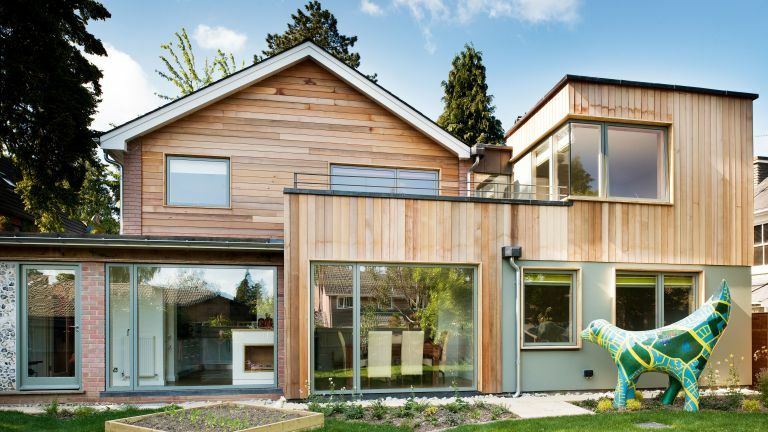 From traditional style oak framed extensions to glass box extensions and everything in between, find inspiration for your own project with our pick of the best doulbe storey extension design ideas. Want more practical advice? Don't miss our guide to planning and building a double storey extension. All these double storey extension design ideas are real homes, which makes them realistic inspiration for your own project. Use them for design ideas, pricing information and extension advice, too. The owners of this stone-built farmhouse, located in a small town between Carmarthen and Lampeter in west Wales, tasked oak frame design-and-build specialist Arboreta with creating more space. The oak frame extension was designed to take in views with a sunroom downstairs and bedroom above. Lots of glazing was incorporated while maintaining a look that was sympathetic to the period style of the home. A similar oak-framed extension would cost around £75,000. Find out how to build an oak frame extension and use these oak frame extension design ideas for inspiration. If you're building down into a basement, a glazed double storey extension will make the most of light – and will enhance the space, particularly if the extension overlooks a courtyard garden that could be bigger. If budget allows, choose wide expanses of glazing over detailed or heavy framing; this will maximise the light indoors and create a contemporary appeal. Find out more about designing a glass extension in our practical guide. Looking for double storey extension design ideas for a narrow plot? This can provide challenges, with neighbours, quite rightly, able to contest any plans on the grounds of their right to light. This two storey extension skirts the problem, with the walls of the upper storey well clear of the boundaries on either side of the house. Find out more about how to extend a Victorian house in our guide. Think about the form of your double storey extension design idea as you're planning it. A square extension is rarely pleasing to look at – and will be overbearing for your neighbours if it stretches from one party wall to the next. Instead, introduce a gable end on the upper floor to create a better looking roofline that still offers bags of interior space. A two storey extension is much more noticeable than a single storey extension, so it either needs to contrast sharply (like the glazed extension above) or it needs to blend seamlessly with your existing house. This two storey extension below takes the latter approach, being built in keeping with the original, 1950s house. Find out how to add a double storey extension without planning permission. If you want a contemporary finish – and particularly if you have chosen a very contemporary shape and form for your extension – picking out exterior finishes that contrast both with each other and your original house can work brilliantly. Read our guide to cladding and renders to work out what to choose for your home's exterior. This has to be done with great care – and possibly with the consent of your local council, particularly if you live in a conservation area, but it can work. Here, the bricks are the same size as the originals, and the same tone, but their different colours cleverly define the old and the new. More more stand-out statement extensions like this, see our design gallery. Want to create views from upper floors and impact at garden basement level? The solution, especially in a narrow terraced space, is to build a galleried two storey glazed extension. It will allow the existing rooms to be flooded with light but give you more indoor-outdoor living space. Architect Your Home was chosen to design this double storey extension (below) in keeping with the street scene for this house in Surrey. The owners wanted a modern style with white rendered walls and sliding doors. Built in place of the garage, the extension creates a home office, utility room and large kitchen that opens out onto the dining room and garden. Upstairs, two new bedrooms were created. If yours is a period home, particularly in a rustic setting, it's worth designing an extension that, from the outside at least, is entirely complementary to your existing building. This can be achieved with matched materials, a roofline that flatters that of the original house, and windows and doors picked to blend with the originals. For more extension ideas for period homes, check out our design gallery. To connect the two distinct areas of their Swansea home, the owners commissioned this double storey extension (below) in the form of a glass atrium from Apropos. The stunning double-height design mirrors the roof pitch of the main building sections, to bridge the two wings of the house. The light-filled space is used as an entrance hall and quiet living area that allows the garden to be enjoyed all year. This is a solution that can please planners when you're looking to connect two existing period properties. A desire for more living space led the owners of this Bristol property to contact Vale Garden Houses, which created a double storey extension that adds a garden room off the existing downstairs living space and an enlarged kitchen-diner above; a roof lantern ensures the room is filled with natural light. Local stone was sourced to match the main building, with traditional timber used for the frame, incorporating decorative mouldings and classical columns. Sliding sash windows ensure continuity with the existing house. Find out more about planning and designing an orangery style extension with our guide. Looking for double storey extension design ideas with a highly modern finish? Using a metallic cladding will give even the most ordinary of two storey extensions a highly contemporary, smart finish. However, this needs to be done with caution – particularly because some finishes can be extremely expensive, and will give your house a distinctly different feel from others in the street. So, before you proceed, consult a trusted estate agent to find out if making your house stand out so strongly might damage its value. Find out more about choosing the right exterior finish for your home to get yours right. It's not always easy to get planners to give you planning permission for an extension that's visible at the front of your house – and particularly a two storey extension. This clever clad contrast seems to have passed muster, though, giving the home it's attached to a contemporary update. When you're extending upwards and outwards, it's easy to be distracted by rooflines and floorplans and not give quite enough thought to windows and doors. Bifold or sliding doors downstairs to merge the garden and the new extension are a given, but don't neglect to give lots of thought to the design of the windows upstairs, too. Here, the windows have been successfully designed to both flood the interiors with light and to create a visual impact from outside. What to say about this striking two storey extension? It has bags of glazing, concealed upper windows and a sculptural appeal. Genius. This double storey annexe extension is actually an upscaled garage conversion. The original structure was knocked down and removed to make way for this two storey building that has space for guests and hobbies. See the full project. Don't miss our guides to garage conversions and building an annexe, too. Laura and Matt’s end-of-terrace house sits on piece of land with an oddly shaped, tapered plot of land at the side, which they decided to use as a space to expand their home. They created a staggered, double storey extension that fits snugly into the tight space and which better accommodates their young family, adding extra reception, utility and bedroom space to the side of their ex-council house. The entire project cost £143,000, including the renovation of the rest of the house. To see the entire project, including the inside of the house, click the link.